The diet of a seagull is multifaceted to say the least. A seagull is one of the few birds with very little discernment about what it consumes. 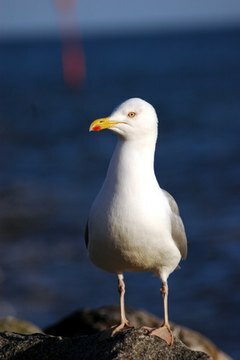 While the preference of seagulls is usually fish, mollusks, and invertebrate insects like worms, they will not hesitate to eat from a trash can. Seagulls are capable of hovering just above a water's surface without actually having to break through it. Their elongated sharp beaks are ideal for snatching prey from the water, particularly fish that swim near the surface of shallow water. They will also fly over beach areas in search of worms and mollusks lurking in the sand. Seagulls, known for staying in coastal areas of the northern hemisphere, have a tendency to congregate near offshore areas. This is because the cold water areas of the continental shelf make it an ideal place for seagulls to gather and feed off the carcasses of sea animals, even whales, that have drifted ashore. Seagulls are often thought of as the type of bird to eat anything. This is generally true, however, they do prefer to catch live food as opposed to already finding it dead. Catching crabs, fish, and mollusks is in their nature. The seagull can drink salt water and fresh water. The salt will not stay in the seagull's system because it is flushed out through a special set of glands. This allows the seagull to remain in the coastal areas it thrives in, where ocean water is the main source for hydration. The propensity seagulls have for eating trash can come at inopportune moments for those who must share a venue with them. Stadiums near a seagull habitat will often get a bunch of them to drop by right around the end of a game where the birds simply know there will be plenty of leftovers to snack on. It led to a notorious event in 2009 in Cleveland. A pack of seagulls had arrived toward the end of an extra inning game and were camped in the outfield. A hit ball struck one of the birds. The bird was unharmed, but it deflected the ball away from the Kansas City outfielder and allowed the hometown Indians to score the winning run.